"Whatever you wish, your the driver." I replied. And watched her face and examined the way she drove out of the corner of my eye. I would have grabbed her hand if the car wasn't a manual. I carefully watched the speedometer we were going about 90 almost 100. Not very fast but we hit the city quickly. "But afterward we have to go do some fast driving." I said smiling at her. "Hey, I'm just cruising here. Are you in a rush to get rid of me?" Valisa asked him, glancing over quickly before turning her eyes back to the road. Shifting the gears, I pressed the peddle harder and heard the quiet whine of the engine as I sped up. "Happy?" She asked, a smirk growing on her face. Once Riley had made his way away from human i he took off running through the woods. He was semi-thirsty so he headed out to find something to take down. He made his way deep into the woods till he came upon a river and some grizzly's. He didn't care which one was the biggest he just wrestled with the nearest one before sinking his teeth into it's neck and drinking it's blood. He let go of the body and just looked at it. (Arielle) I gave the boy and girl suitable time to finish there hunt and leave before heading back toward the river. I could smell that the grizzles had returned and I was extremely thirst. I had already made up my mind that if they were still there I didn't care. I needed the food and grizzly provided plenty. Riley took in a deep breath and could smell another vampire coming his way. He didn't know if he should stay or go. He hurried and disappeared into some bushes and sat down and watched the grizzlies around the river and waited for the other vampires. He wanted to know if it was the same ones from the male or what. I didn't even pause as I ran out of the forest. I quickly killed a bear and sucked its blood dry. It had been far to long since my last feed so I killed a second and sucked that dry too. After I was done I turned to skin them and realized there was a third dead grizzly on the other side of the back. "Stupid Vamps." I muttered but I was still hungry so I sat down and skinned both bears. Soon another female vampire came into view and killed two grizzlies. He sat there quietly and watched her skin the two dead grizzlies. He didn't know if he should go out and try and make friends but he didn't want to scare her off. So he continued sitting there silenting and watched her skin the bears carefully. I gathered up twigs and started a fire right on the river side. I unfolded my hikers pot and scooped the water from the river. Chopping the meat into small parts and starting a stew I through in various plants and spices I'd collected from the forest and watched it cook hungrily. Riley was confused slightly, she had just fed and now she was cooking up the meat from the bears. As far as he knew vampires couldn't eat human food. He made the bold move to step out of the bushes. Standing up quietly he stood outside of the bushes. "Why are you cooking food?" he asked quietly but loud enough for her to hear him. (Arielle) I jumped at the sound of another's voice. "Stupid Vamps." I muttered I wanted to yell it. 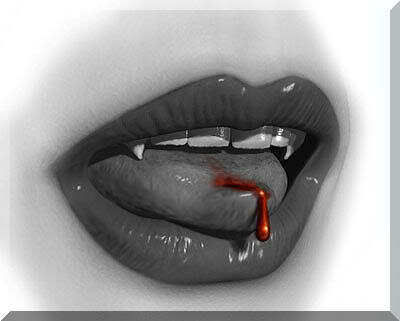 Why did there have to be so many vamps around here? "I'm hungry." I replied sitting back down. I wasn't exactly thinking logically at this moment I just wanted the food to fill my belly and it would take a lot of blood to do that. He smirked somewhat when she called him a stupid vamp. He tilted his head to the side still confused. "Your a vampire right?" he asked her. he took a few more steps to her but stopped and looked at her. "Obivious Vamp." I muttered. "Obviously I'm not a vamp." I replied. Glaring at him as he moved closer. I really didn't want to leave right now. I just wanted the stupid food. She wasn't very friendly but Riley didn't let that get to him. She glared at him and he just gave her a sweet smile. "I'm Riley Mason by the way." he introduced. He sat down where he was standing and watched her cook her food in silence like he had done in the bushes. I kept an eye on this Riley. While I continued to cook my food. No matter what he said I still didn't feel it worthy to trust him. But that had always been my nature. It took a lot for me to trust someone. We sat in silence even as I finish cooking and started to eat it out of the pot. "I suspect you came to hunt." I indicated the dead bear laying but a yard to his left. "Yea sorry about the mess. I heard someone coming so i hid to see who it was. It ended up being you." he stated. It wasn't awkward for Riley when the two were sitting in silence. He had let all his defenses down and was very relaxed but he could tell that she was ready to bolt if he tried anything. Looking away from her he looked over at the water and stared at it instead of her. He wasn't trying to be rude or anything he was just trying to be polite but it was hard for him to do. He really didn't like any contact with anyone. "If I was more aware I would have noticed you there anyway." I replied while he stared out at the water. He seemed to be relaxed and I couldn't help myself he reminded me of my mother. Always there but never pushy. "I'm Arielle." I muttered finally taking my eyes off of him for a second. "Arielle." he said under his breath. "A very beautiful name." he whispered. He glanced over at her. "Oh really." he said smiling lightly at her. He turned his attention back to the water again. "Well I'm quite good at knowing when others are around. You could say I have a gift for that sort of thing." I said smiling beside myself. Was I really letting go? Should I be allowing myself to be this relaxed here? Could I help it? My current state scared me quite a bit but I didn't let it show. I couldn't help but not relax around this strange man. And that was a miracle in and around itself. "Well it's nice to know i wouldn't be the only freaky vampire around here with a gift." he laughed lightly to himself. He could see from the corner of his eyes that she was smiling. Sighing he laid back and put his hands behind his head as he looked up at the sky. He had nothing to worry about she was nothing to worry about. It was weird for him, he was never very comfortable around people, he never really talked to anyone but here he was talking to Arielle a girl he just met and even enjoying her company it was a little new to him but he liked it. I watched as he laid back wondering if this was as strange to him as it was to me. I had some since that was telling me I wasn't alone in my feelings. I smiled to myself yet again. I looked down at my empty pot I didn't really want to run as I usually did from another's company. "Dame." I muttered as my excuse to stay was gone. Riley got this feeling that she was going to leave. He looked over at her before speaking. "You know you could lay here and enjoy the quietness and the outdoors with me. You don't have to leave." he told her. He was arguing inside his mind, if he should stay or go or if he should just let her run but he didn't want to. He knew things could take a turn for the worst but he didn't want that to happen and he still wasn't going to run. I sat surprised by his request. I mean to anyone else it would have been an off handed comment but I knew he really wished for it to be true. "I feel as if I stair at the stars far to often." I replied glancing at the sky. I found him much more interesting than the small specks above our head. "Oh, we can just talk if you want. But if you don't wanna hang around it's cool." he said sitting up. He could tell at the beginning that she was surprised by his request for her to stay. "At this moment I'm not sure of what I want." I muttered. Then quickly shut my mouth. Had I just openly told him something like that. Sure it was completely true but why didn't I just take the opportunity to run when he so willing presented it to me. Sure a huge part of me was screaming to do just that but a must more willful part was telling me it couldn't do any harm to just talk to the boy. He sat there quietly not sure of what to say to her. He wanted her to hang around but if she chose to run then he wouldn't try and stop her. "Well whatever you chose will be fine." he finally replied. He sat there watching her silently as she decided and weighed all the options.